Partnerships between members of families and with friends maybe the most problematic aspect of business life. Two or three people have an idea that going into business is a good idea. They believe that the strength of their relationship is sufficient to carry them through. Embedded in that optimism is the naive belief that their relationship is strong enough to handle the problems they will face in the future. Think of any partnership like a marriage. There is emotion and chemistry that creates a bond that suggests let’s join together to be husband and wife. The same is true in business. Two friends over drinks and barbeques over months, possibly years, begin to think that we can be successful as business partners. Maybe they are right. Maybe they have the business savvy. Maybe they have the focus and commitment to make it work. Maybe they have the right product or market. Maybe they already have an inside track on a client that provides the initial income to make it work. Lots of maybe’s. There are many reasons that partnerships fail. The chief reason that I find is the belief that a good relationship is the same thing as a sound business structure. 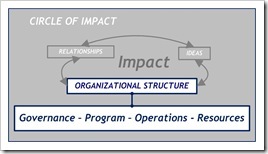 In my Circle of Impact model, the structure of any organization is divided into four areas. Each aspect works in conjunction with the other three. Each is focused on providing the structure, approach and resources to the people of the business to create the impact that fulfills their mission as a company. The more aligned each is with the partners’ relationship the stronger the business. Here’s a brief description of each of these aspects of an organizational structure. Governance – Policies, procedures, plans that guide decision-making and development. Program of Products & Services – The way the business generates revenue. Operations – All those administrative functions that support the programmatic. Resources – Financial, material and human assets that fuel the life of the business. In a partnership between family or friends, these four aspects of the business need to be developed to provide protection for the relationships. Good will and chemistry are not enough to make a successful marriage, and neither are they for a business. For example, in a partnership, often the partners are employed as the managers of the company. They believe their familiarity with one another will make communication easier and more effective. However, while certain values may form the core of the relationship, they may not be the core business values of the individual partners. As a result, common decisions about things like personnel and purchasing can become sources of conflict. This typically is the case where there is no clearly prescribed method for making these decisions. What I find is that partners in new businesses are good at identifying the sales opportunity. They come out of another business where the infrastructure of governance that supports the business is in place and has reached its maturity. Often, it is the maturity of that functioning that suggests a lack of freedom and opportunity and the appeal of starting a business partnership. Creating governance policies for running a business is a daily exercise in a business partnership. You can read books and ask for advice, but eventually, the partners have to decided what is best for their business. This is part of the reason that starting a new business is such an investment of time and energy. Over time, this creative process reveals divisions in the values and expectations of the partners. It does happen, regardless of how close your friendship is. As a result, the conflict between the partners becomes the focus of the business, rather than the business itself. It is a significant distraction that should not be allowed to linger. While you are trying to figure out how to make your partnership relationship work, business opportunity is being lost. If you are in a family business or partnership with friends, what should you do to guard against the loss of friendship and its impact upon your business? If you are contemplating starting a business, taking your time to get the structure right so that it protects your friendship is essential. Be absolutely clear about how you will function as partners and co-workers. My advice is to hire a consultant or coach to work through these many questions. I am not being self-serving in this advice. An outsider can help you strengthen your relationship by defining boundaries of the relationship and establishing the parameters for how you will function as partners. If you are already in a business partnership, here are three areas for discussion. 1. Define for each individual partner the role and responsibility as an owner of the business. Establish an ownership structure that is clear about the responsibilities of ownership. This is especially true if none of the partners has ever owned their own business. It is vitally important that partners are open and transparent with one another. This especially true as it relates to how personal finances relate to the business. A business partner who is financially over extended will have different expectations for using the company as a source of income than those partners who are not. It is essential that any partnership agreement be clear about how owners are to access the resources of the business. It is in your best interest as family and friends to conduct an annual review of your partnership agreement. The purpose is to communicate openly about your relationship as family and friends in the context of the success and future of the business. 2. Define for each individual partner their role and responsibility as an employee of the business. Distinguishing between the roles of owner and manager is not as easy as it make seem. The basis for decision-making is different. 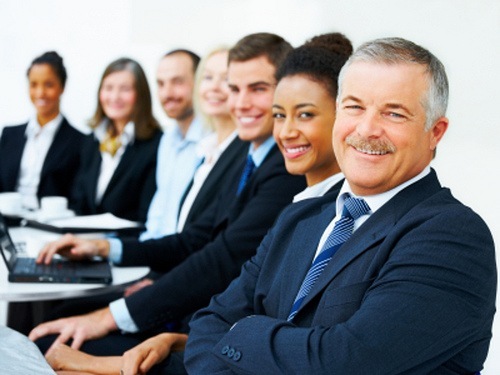 It is therefore important that a management structure be establish that clearly defines roles. This is especially true if one of the partners is to be the managing partner for the company, and the other partners are in subordinate managerial roles, as is the case in many family businesses. 3. Define how to resolve the differences and conflicts that emerge between partners. Establishing a process of communication and conflict resolution provides a foundation for protecting the relationships between family or friends. There should be an expectation that your relationships will change and grow because of your relationship as partners. If there is a lack of communication, or an unwillingness to change, then the partnership will become more difficult, and a distraction from effective management of the business. A business partnership is not only a test of the friendship, it is a test of the character of the individual partners. A successful partnership is made of men and women who are willing to put their own personal interests aside for the good of the business. Business partnerships between family and friends constitute the vast majority of businesses that exist. The importance of creating structures that enhance communication and protect the relationships between partners must be recognized by each partner. The legacy of your company isn’t the wealth that you create, but the example of family and friends transcending their own private interest to create an institution that has lasting value. It is this ability to change personally that is the key to whether a partnership will survive. If you can, then whatever business challenge you face can be met with success. Tagged with Business, communication, conflict, family, finances, friends, governance, operations, partnership, policies, program, relationships, resources, responsibility, structure.